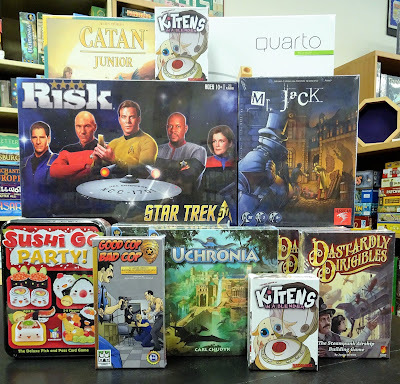 Here are this week's game arrivals - - some new and some restocks. Sushi Go gets a party! 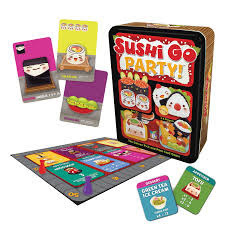 Its a party platter of mega maki, super sashimi, and endless edamame in this expanded version of the card game Sushi Go. You still earn points by picking winning sushi combos, but now you can customize each game by choosing a la carte from a menu of more than 20 delectable dishes. This party edition plays with up to 8 players. 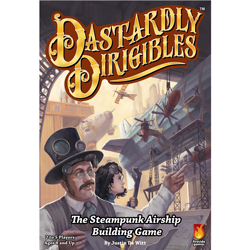 Dastardly Dirigible is a new Steampunk themed card game about building dirigibles. 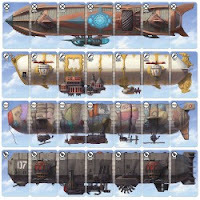 Players build their airships from different parts of 9 beautiful suits. Each time a part is added, all players must add the same part that may or may not replace an existing one. There are 12 special cards that players can use to their advantage or to thwart their opponents. The round ends when the first airship is complete. You score only the suit used most in your airship. Become the greatest Commander in Starfleet history as you join in Risk®: Star Trek™ 50th Anniversary Edition. 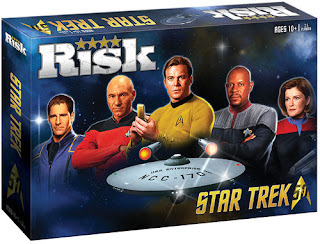 Risk®: Star Trek™ transforms the classic game of strategic conquest into a battle among all five captains. Featuring a custom game board, two ways to play, five military fleets (including 6 different ships) and more than 600 total pieces, this game of galactic dominance will take fans on an adventure as they command ships, assemble their away teams, and complete Quests in a journey across the Galaxy.